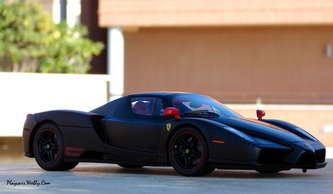 Ferrari Enzo is for sure the most impressive Ferrari car of the 21th century. 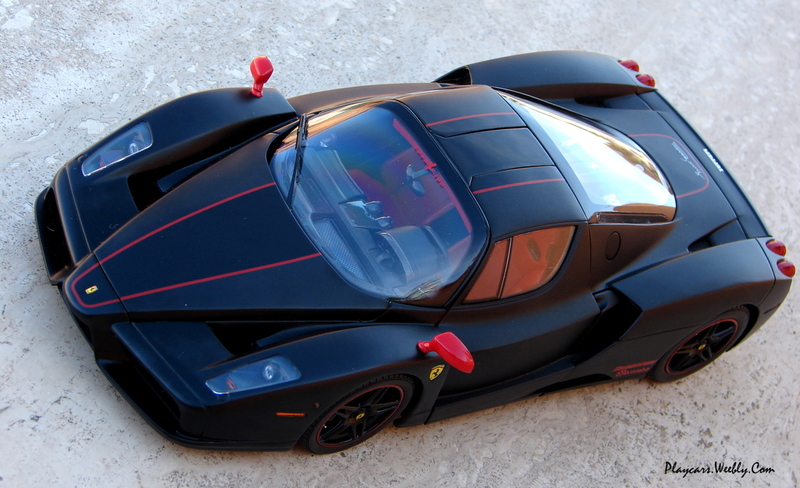 And a top range supercar needs an impressive replica in scale, too. 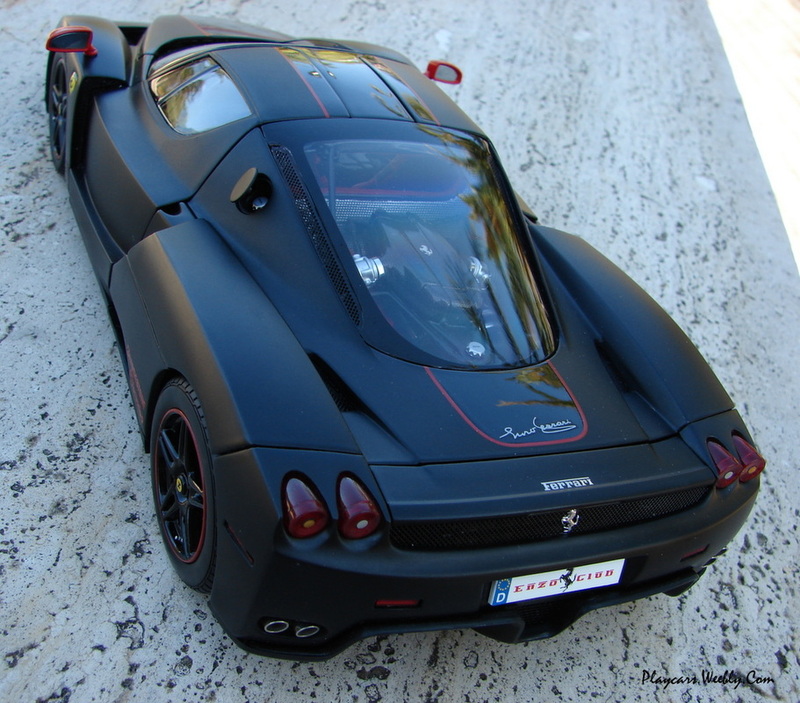 The best version on the market at the date when this article was wrote, is provided by BBR. 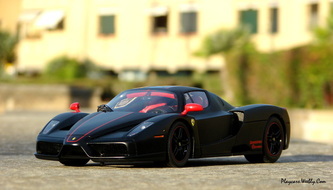 Most known for their 1:43 releases, the Italian brand launched in almost ten years many variations of this model, having different colours or being the test versions. 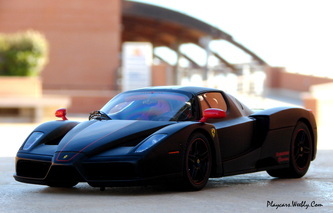 The Ferrari Enzo seems to be their favorite car to replicate and is their first foray into 1:18 scale. In my collection I have the “Enzo Club” version of this fabulous Ferrari. Being released many time after the first version it has a new package: a folding card box, including a styrofoam base to fix the model on. This isn’t the best solution in comparison with the first made of poliystyrene just because inside, the plastic meant to keep the model secure is touching its roof and during the manipulation of the box, scratches the paint. A suitcase and a wheel remove tool are included. 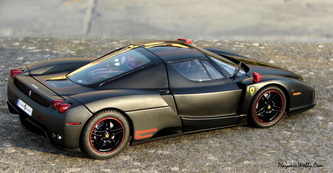 The model is a limited edition of 204 pieces, for this edition and the individual number of each model is specified on a little paper label attached to the model. This model pretends to be from the high end range. On an overall look is easy to see that BBR captured the essence of the Enzo perfectly. The aggressive stance with the long front overhang has been reproduced exactly. 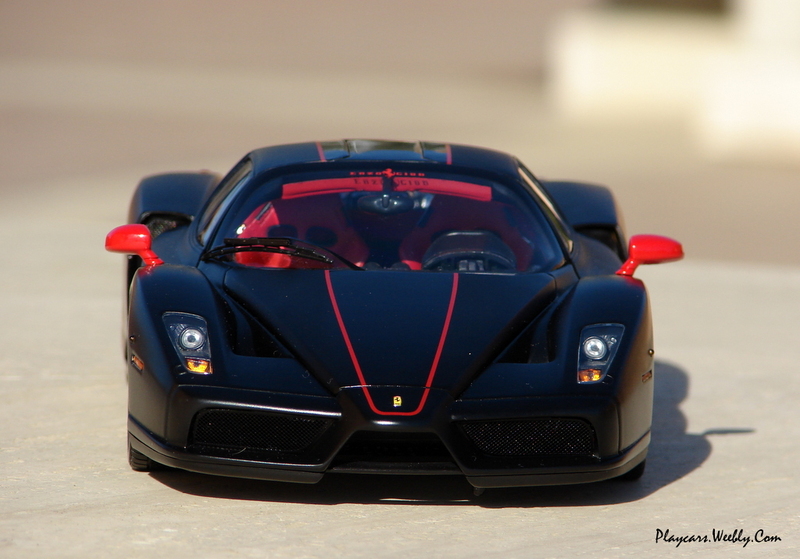 This version is painted in a matte black color having a central glossy black stripe along the body surrounded by a thin frame painted in red. 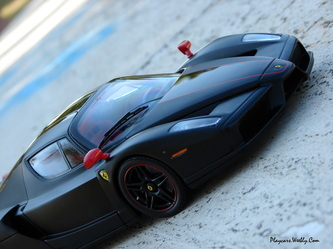 The paint is very well applied and looks very good how long as you are not touching the model. The paint is very delicate and every fingerprint will be visible. 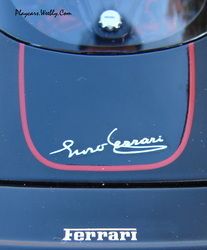 The prancing horse badges are individual pieces and the “Ferrari “ inscription on the spoiler is a metallic photo etched part. 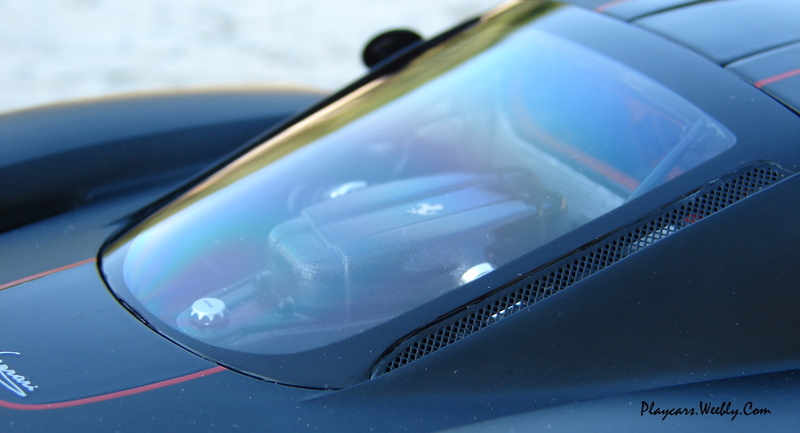 The lights are accurately reproduced having the light bulbs and the carbon fiber patterned surrounds, but visible attachment stubs. For taillights they chose the short way using paint to replicate the reverse lights and turn indicators, instead of colored plastic. All vents are covered with fine real metallic mesh, as it should. The rims are made of plastic, but nice replicas of their 1:1 counterparts. The spokes are crisply detailed and even the tire valve was replicated as a separate piece. Tires are accurate, but have no markings. 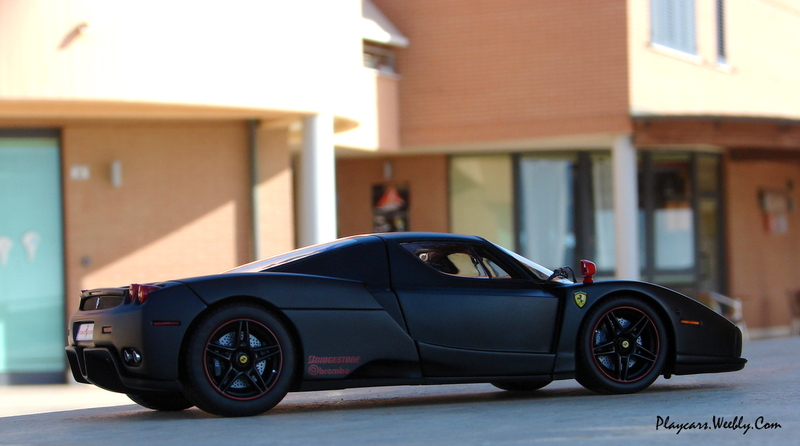 The wheels are removable using the included tool and reveal the beautiful modeled brake system. The brake disks have the correct carbon look and are dimpled to fake crossed drilling. 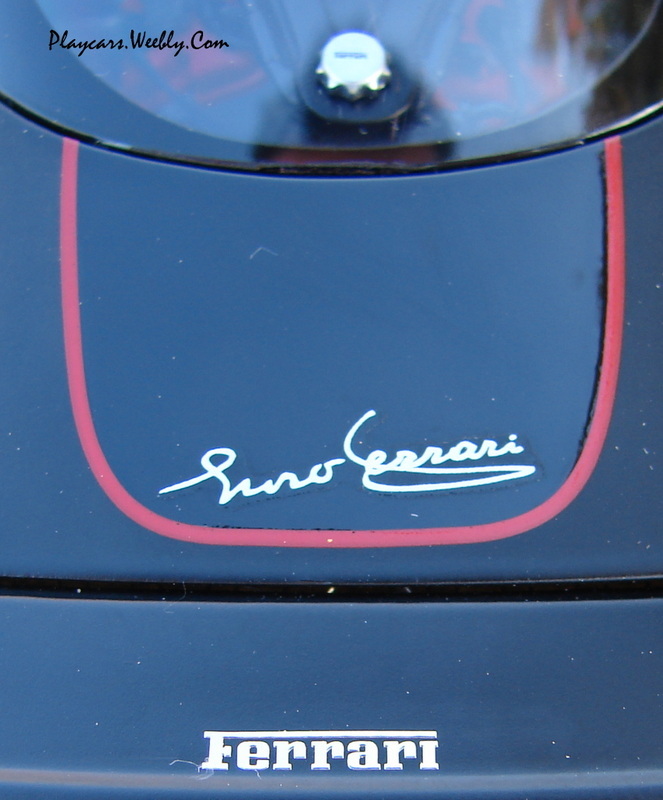 The calipers are paint in black on this version and marked with “Ferrari” lettering. 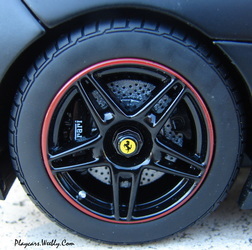 The brake rotors rotate independent of the static calipers. The bonnets and doors can be opened. While accurately modeled, with its scalloped design that opens right down to the bottom of the car, they do not open quite as wide as they should. 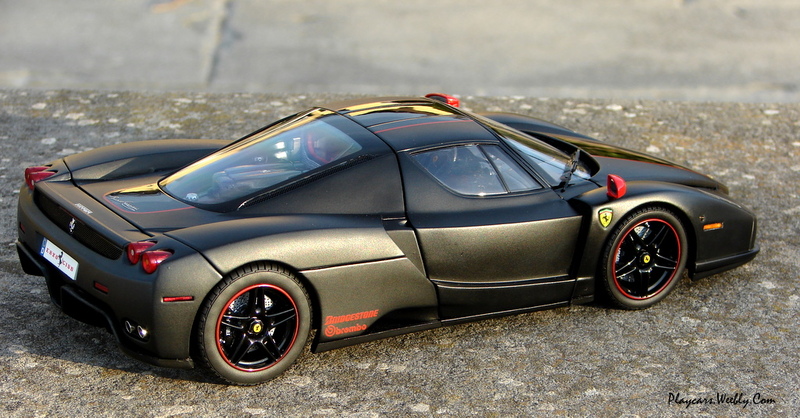 This design flaw makes the model look rather ungainly with its doors opened and also limits viewing of the interior of the model to a certain extent. The front hood opens on nicely fine struts. The large engine cover on the other hand swings up wide and is held open by a black metal rod found in the accessories pack. The fuel flap can be opened and the spoiler is functional. 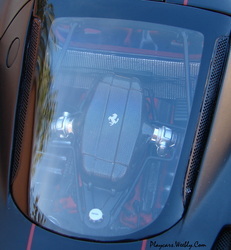 The undercarriage, as one would expect on any modern Ferrari, is completely flat. 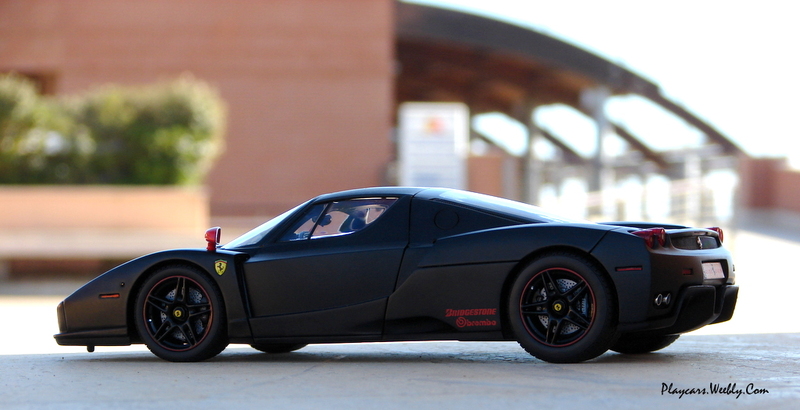 Unlike similar high end models from Exoto or CMC, the undercarriage is made of black plastic as opposed to metal. What looks like rivets or screw heads are moulded into the plastic itself and not separate pieces. 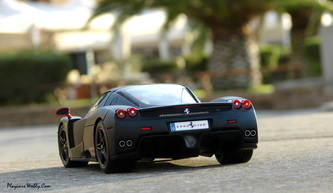 The undercarriage also features a spoiler at the front and an air splitter at the rear. 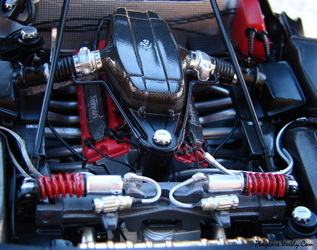 Front suspension details are clearly visible when looking up from underneath the car while the rear suspension is hidden from view. 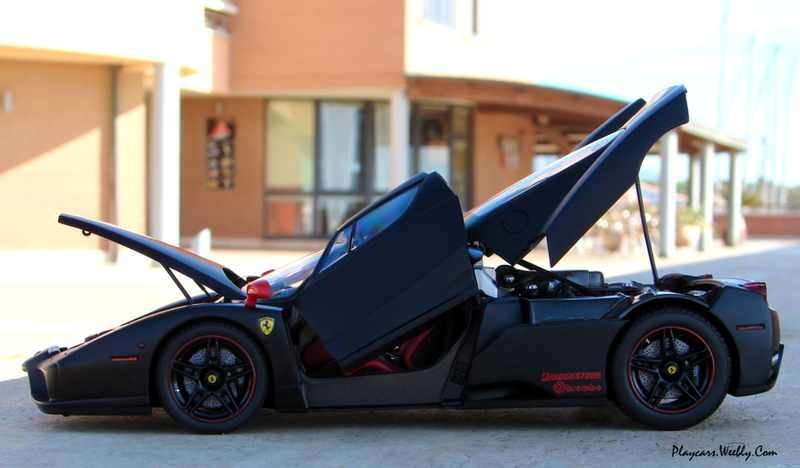 The model features working suspension on all four wheels via metal suspension arms. The cockpit looks good but for the pretended level of this model the real leather covered seats were a must. 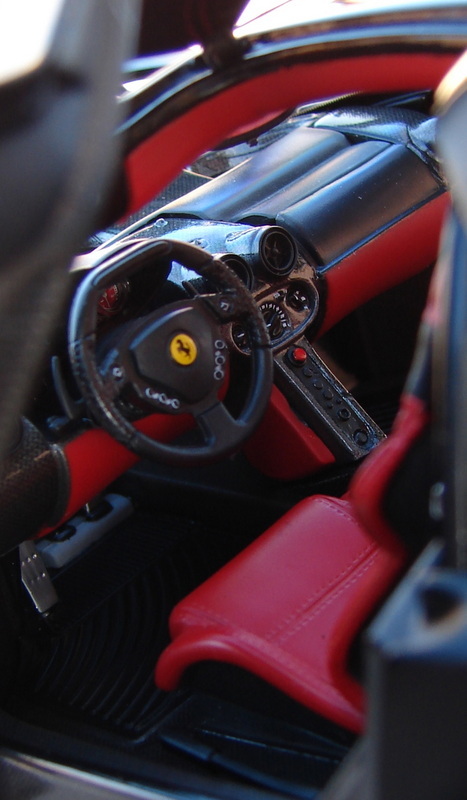 The carbon pattern is nicely detailed the central console has the buttons modeled and paint. They used a sticker to replicate the indicators and create a decent result. 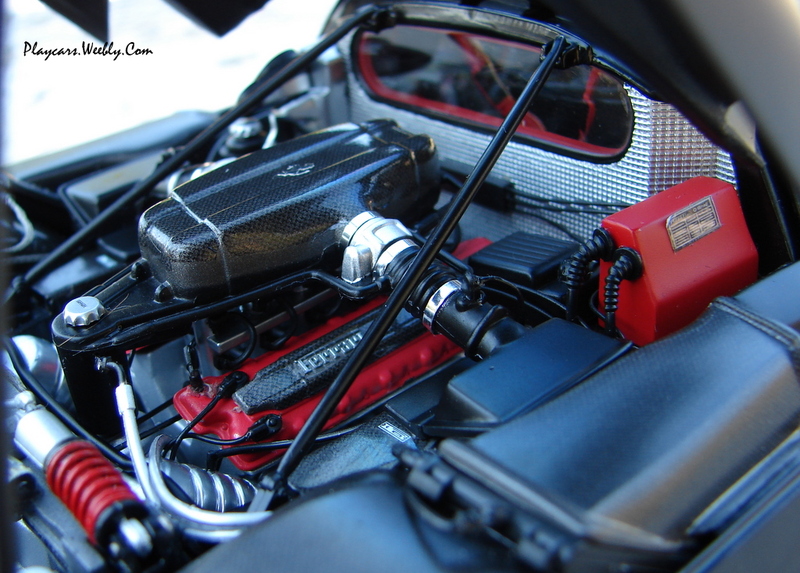 The engine bay is well detailed with springs for the suspension, tiny labels on top of the wheel wells, carbon fiber pattern on various covers and panels, aluminium insulation look on the firewall and crisscrossing wires and cables etc. The carbon fiber pattern looks very good and was nicely applied. 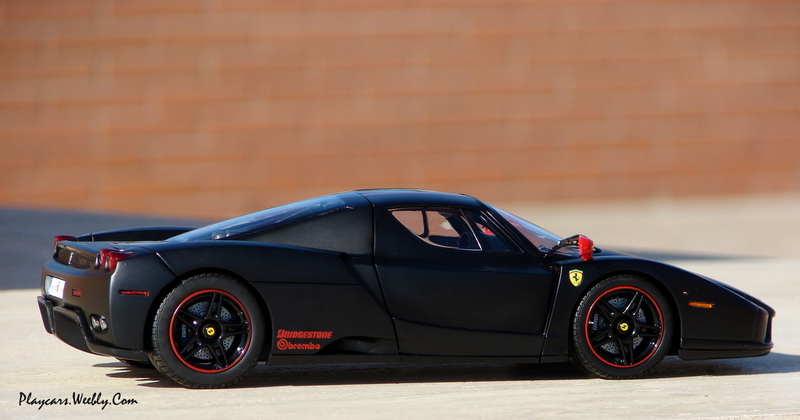 I still think some better details could be added, like the transparent hoses made of rubber used by Exoto. 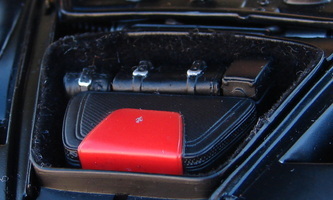 Using a button located underneath the boot at the front can be opened and other nice details are revealed. The tray is lined to simulate carpeting and is removable. 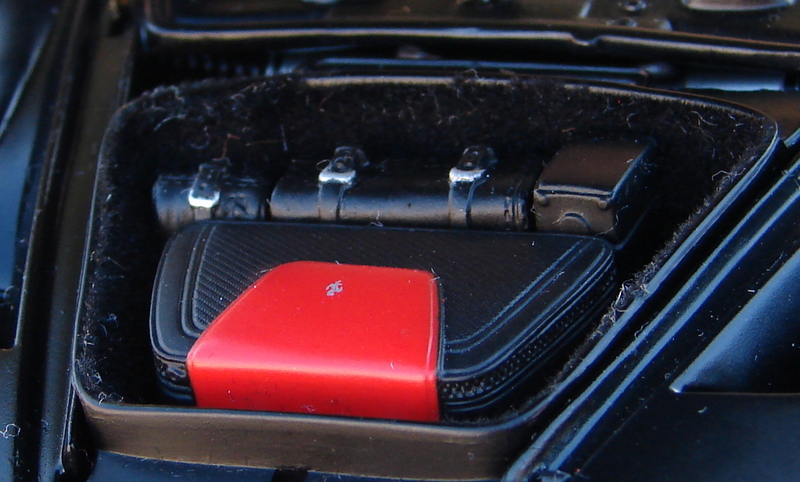 An extremely detailed battery can be found underneath the luggage tray. 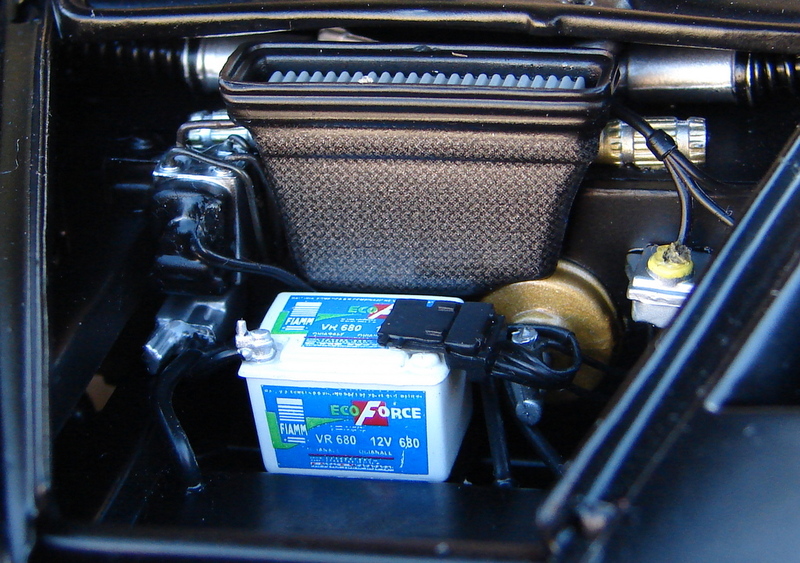 One can also look through the holes in the front compartment and see the detailed coil spring front suspension. 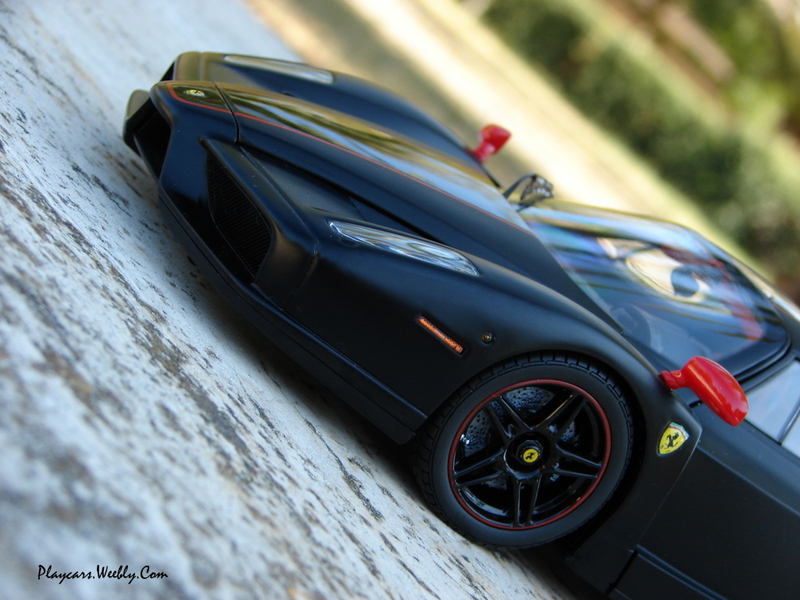 The model is great, featuring a lot of nice looking details, a good paint, functional parts, but still lacks some details which can be found at the other manufacturers from the high-end level. At this date the prices are high, but the good offers can still be found since the manufacturer concentrates his attention on resin made models. For me is the best scale replica of the most intriguer Ferrari.